Synthetic phosphopeptide derived from the region of Insulin Receptor that contains tyrosine 1158. The corresponding residue in the IGF1R is 1131. CHO-T cells transfected with a vector containing insulin receptor and stimulated with insulin, and HepG2 cells +/- insulin. The antibody has been negatively preadsorbed using a non-phosphopeptide corresponding to the site of phosphorylation to remove antibody that is reactive with non-phosphorylated Insulin Receptor (IR). The final product is generated by affinity chromatography using an IR-derived peptide phosphorylated at tyrosine 1158(tyrosine 1131 for IGF1R). Our Abpromise guarantee covers the use of ab5679 in the following tested applications. WB 1/1000. Detects a band of approximately 120 kDa. Receptor tyrosine kinase which mediates actions of insulin-like growth factor 1 (IGF1). Binds IGF1 with high affinity and IGF2 and insulin (INS) with a lower affinity. The activated IGF1R is involved in cell growth and survival control. IGF1R is crucial for tumor transformation and survival of malignant cell. Ligand binding activates the receptor kinase, leading to receptor autophosphorylation, and tyrosines phosphorylation of multiple substrates, that function as signaling adapter proteins including, the insulin-receptor substrates (IRS1/2), Shc and 14-3-3 proteins. Phosphorylation of IRSs proteins lead to the activation of two main signaling pathways: the PI3K-AKT/PKB pathway and the Ras-MAPK pathway. The result of activating the MAPK pathway is increased cellular proliferation, whereas activating the PI3K pathway inhibits apoptosis and stimulates protein synthesis. Phosphorylated IRS1 can activate the 85 kDa regulatory subunit of PI3K (PIK3R1), leading to activation of several downstream substrates, including protein AKT/PKB. AKT phosphorylation, in turn, enhances protein synthesis through mTOR activation and triggers the antiapoptotic effects of IGFIR through phosphorylation and inactivation of BAD. In parallel to PI3K-driven signaling, recruitment of Grb2/SOS by phosphorylated IRS1 or Shc leads to recruitment of Ras and activation of the ras-MAPK pathway. In addition to these two main signaling pathways IGF1R signals also through the Janus kinase/signal transducer and activator of transcription pathway (JAK/STAT). Phosphorylation of JAK proteins can lead to phosphorylation/activation of signal transducers and activators of transcription (STAT) proteins. In particular activation of STAT3, may be essential for the transforming activity of IGF1R. The JAK/STAT pathway activates gene transcription and may be responsible for the transforming activity. JNK kinases can also be activated by the IGF1R. IGF1 exerts inhibiting activities on JNK activation via phosphorylation and inhibition of MAP3K5/ASK1, which is able to directly associate with the IGF1R. When present in a hybrid receptor with INSR, binds IGF1. PubMed:12138094 shows that hybrid receptors composed of IGF1R and INSR isoform Long are activated with a high affinity by IGF1, with low affinity by IGF2 and not significantly activated by insulin, and that hybrid receptors composed of IGF1R and INSR isoform Short are activated by IGF1, IGF2 and insulin. In contrast, PubMed:16831875 shows that hybrid receptors composed of IGF1R and INSR isoform Long and hybrid receptors composed of IGF1R and INSR isoform Short have similar binding characteristics, both bind IGF1 and have a low affinity for insulin. Belongs to the protein kinase superfamily. Tyr protein kinase family. Insulin receptor subfamily. Autophosphorylated on tyrosine residues in response to ligand binding. Autophosphorylation occurs in trans, i.e. one subunit of the dimeric receptor phosphorylates tyrosine residues on the other subunit. Autophosphorylation occurs in a sequential manner; Tyr-1165 is predominantly phosphorylated first, followed by phosphorylation of Tyr-1161 and Tyr-1166. While every single phosphorylation increases kinase activity, all three tyrosine residues in the kinase activation loop (Tyr-1165, Tyr-1161 and Tyr-1166) have to be phosphorylated for optimal activity. Can be autophosphorylated at additional tyrosine residues (in vitro). Autophosphorylated is followed by phosphorylation of juxtamembrane tyrosines and C-terminal serines. Phosphorylation of Tyr-980 is required for IRS1- and SHC1-binding. Phosphorylation of Ser-1278 by GSK-3beta restrains kinase activity and promotes cell surface expression, it requires a priming phosphorylation at Ser-1282. Dephosphorylated by PTPN1. Polyubiquitinated at Lys-1168 and Lys-1171 through both 'Lys-48' and 'Lys-29' linkages, promoting receptor endocytosis and subsequent degradation by the proteasome. Ubiquitination is facilitated by pre-existing phosphorylation. Controlled by regulated intramembrane proteolysis (RIP). Undergoes metalloprotease-dependent constitutive ectodomain shedding to produce a membrane-anchored 52 kDa C-Terminal fragment which is further processed by presenilin gamma-secretase to yield an intracellular 50 kDa fragment. Peptide Competition: Extracts prepared from CHO-T cells transfected with an insulin receptor containing vector and stimulated with insulin (1-4) or left unstimulated (5) were resolved by SDS-PAGE on a 10% polyacrylamide gel and transferred to PVDF. Membranes were blocked with a 5% BSA TBST buffer overnight at 4°C, then incubated with the ab5679 antibody for two hours at room temperature in a 3% BSA-TBST buffer, following prior incubation with: no peptide (1, 5), the non-phosphorylated peptide corresponding to the immunogen (2), a generic phosphotyrosine-containing peptide (3), or, the phosphopeptide immunogen (4). 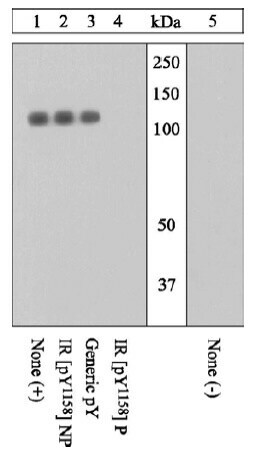 After washing, membranes were incubated with goat F(ab’)2 anti-rabbit IgG HRP conjugate and bands were detected using the Pierce SuperSignal method. The data show that only the phosphopeptide corresponding to Insulin Receptor/IGF1R [pY1158] completely blocks the antibody signal, thereby demonstrating the specificity of the antibody. Publishing research using ab5679? Please let us know so that we can cite the reference in this datasheet. There are currently no Customer reviews or Questions for ab5679.